The tale of how Tutnall & Cobley parish councillors have rolled up their sleeves to bring a wind pump back to life. A once-well-known hilltop landmark is to be restored to its former glory, thanks to a plea from residents and the efforts of parish councillors. 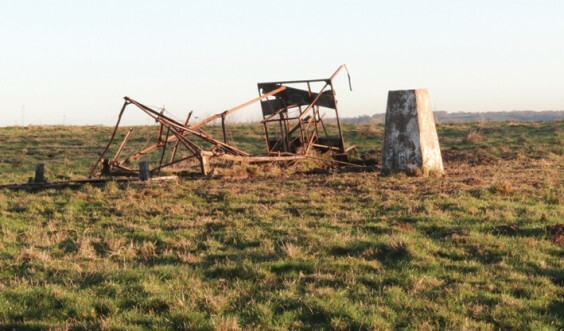 What looks like a pile of scrap metal near the trig point on Cobley Hill, between Alvechurch and Tutnall, was once a state-of-the-art Climax Oil Bath Wind Pump, erected by G Lines & Sons Ltd of Solihull in the 1920s or 30s. The well beneath it provided water for local properties – and still does. However, the wind pump – often known as the Cobley Hill Windmill – toppled over many years ago after years of neglect. An elderly resident, Andy Mason, asked Tutnall & Cobley Parish Council, whose remit covers Cobley Hill, if it could it be rebuilt. “Initially the council could not see any benefit to the community and declined, but many other people voiced affection for it,” says Coun Steve Cooper. The Parish Council then received a legacy to help with the costs of the steelwork. Fortunately, Roger Bence had been able to provide a set of diagrams and instructions for assembling this type of wind pump, probably dating from the 1950s when the structure underwent repairs. Coun Cooper was tasked with assessing the wreckage, and from the remains he came up with a steel-cutting schedule. Bill Duffett and his son Paul, of WD Fabrications in Redditch, won the tender to machine the thousands of parts for this project. It turned out to be rather a complex task with thousands of holes and cutting instructions. In late summer 2018 the steelwork was delivered to the council and in November work began on designing the rotor and vanes. Coun Pete Whittaker started cutting the damaged steel away from the gearbox, and then the trial assembly commenced. The project now has nearly all of the components made and details agreed so work should begin on site very soon – watch this space!